A new tool released by Microsoft to help with MP Authoring. This entry was posted in Management Pack, Tools and tagged #Management Pack, #Tools on March 31, 2015 by Warren Kahn. An updated version of the HP MSA P2000 Management pack has been released, version 1.1.3.8 is available for download here. 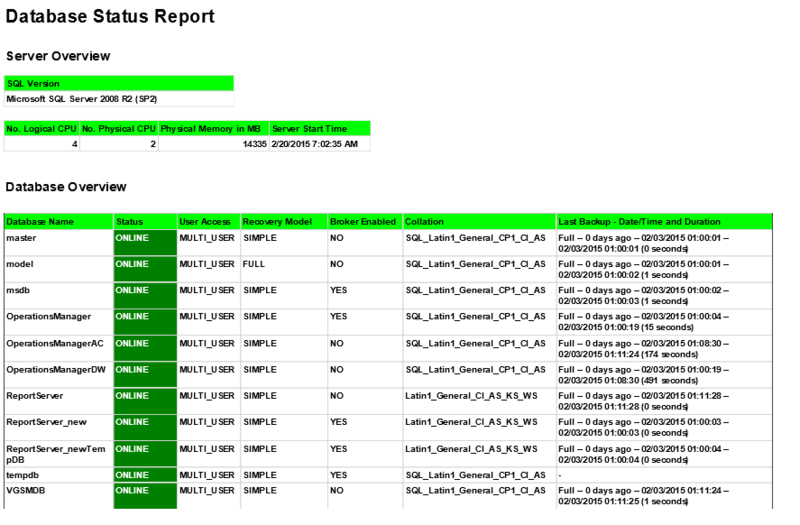 Performance Collection scripts were modified to capture exception when no performance XML file is found. 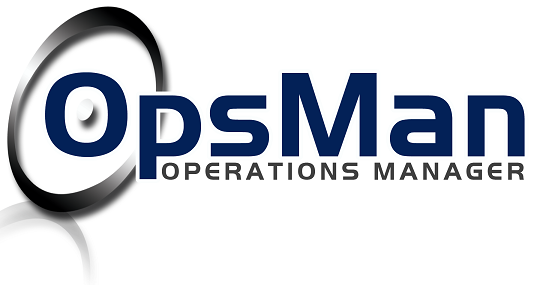 Warning Event 805 is logged in Operations Manager Log on MSA Monitoring Server. Since there are a lot of performance counters to be collected => Performance Rules Collection Intervals were Increased from 2 to 5 minutes. If you choose to change Collection Interval in order not to break Cookdown please make sure that you Change Time interval on all instances for particular class. This entry was posted in Management Pack and tagged #Management Pack on March 27, 2015 by Warren Kahn. Microsoft has released an update for their Dynamics CRM Management packs, they are available for download at the following locations. This entry was posted in Management Pack, SCOM 2012, SCOM 2012 R2 and tagged #Management Pack, #SCOM on March 19, 2015 by Warren Kahn. An updated version of the AD Certificate Services management pack has been released, version 7.1.10100.0 is available for download here. This entry was posted in Management Pack and tagged #Management Pack on March 13, 2015 by Warren Kahn. An update for the Exchange 2013 management pack has been released, version 15.0.665.19 is available for download here. This entry was posted in Management Pack and tagged #Management Pack on March 6, 2015 by Warren Kahn. Microsoft has released an update for the Workflow Manager management pack version 1.0.2015.0 is available for download here. This entry was posted in Management Pack and tagged #Management Pack on March 4, 2015 by Warren Kahn. 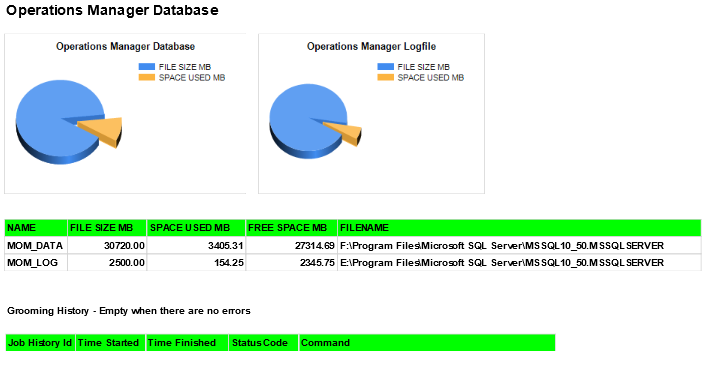 Last month I blogged about a SCOM Database Status Report that I was working on in order to get a single page overview of the SQL environment for a SCOM implementation, as a starting point to a complete SCOM heath report. 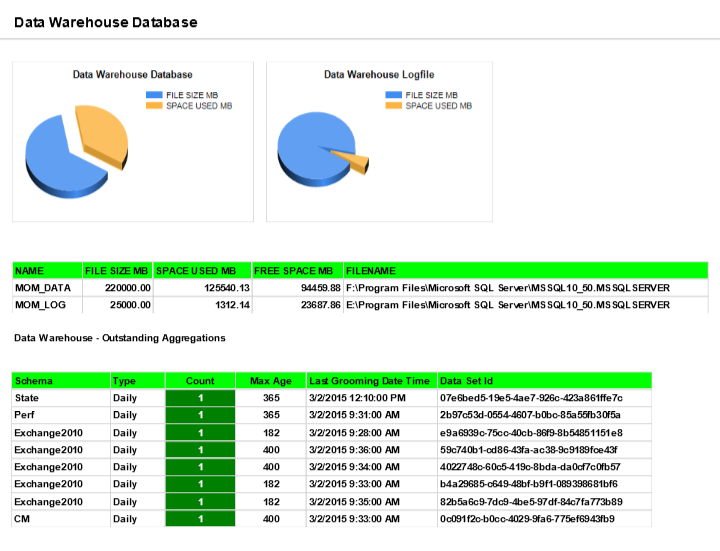 Below are samples of version 3 of the report which now includes additional sections for the OperationsManager database as well as the Data Warehouse. I have also amended some of the colouring to make important aspects easier to identify. I would be interested to hear from anyone who has any comments or suggestions on this report or ideas for future ones. This entry was posted in #SQL, Reporting, SCOM 2012 R2 and tagged #2012, #Reporting, #SCOM, #SQL on March 2, 2015 by Warren Kahn. This entry was posted in Management Pack and tagged #Management Pack on March 1, 2015 by Warren Kahn.